The Corner Stable in Columbia Maryland was the location of the 5th annual Golden Hammer Awards Ceremony held on Wednesday, September 18th. 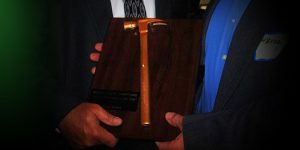 The prestigious Golden Hammer Awards are to recognize individuals and companies that go above and beyond the call of duty to support the Rebuilding Together Howard County. That evening the following awards were presented. 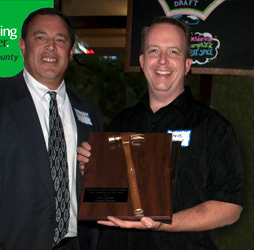 First, Guy Silas, left, president of the board of Rebuilding Together Howard County presented the Rookie of the Year Award to Tom Page, Select Contractors. Tom is joined in the picture with his wife Phyllis. As a first time house captain, Tom led a team of his sub contractors, Aztec Electric Service Inc. and BCT LLC to make repairs for a needy homeowner. Tom did an outstanding job! Second, Steve Kendall received the award for Key Supporter for 2013. Many of the building materials and supplies used to make Rebuilding Together home repairs come from Kendalls Hardware in Clarksville, Maryland. Steve also allowed us to use his back parking lot to distribute the materials to our house captains this year! 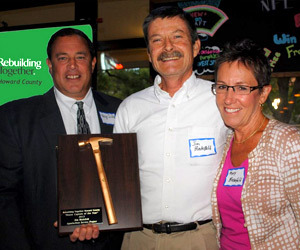 Next, Ed Hamel from Hamel Builders received two Golden Hammer Awards. Ed is joined in the photo by his wife Fern. 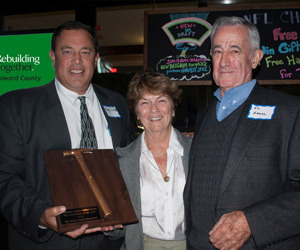 The Hamel Family Foundation received the Key Contributor Award. Also, the Rebuilding Team of the Year Award was awarded to the Hamel Builders Team. The most difficult home repairs of the year was completed by the Hamel Builders Team. They reinforced the foundation of a house which was in the process of falling down on a disabled couple and their daughter, son-in-law and grand child. This was a huge project. Also, thanks to Hamel Builders for being our largest financial contributor. 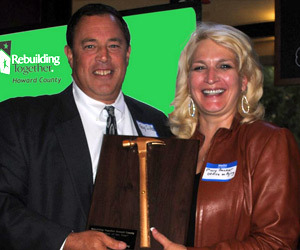 Rebuilding Together Howard County would not be able to achieve it’s goals without the support of Hamel Builders. Mary Becker received the Volunteer of the Year award. Mary worked tirelessly in 2012-2013 to head up a fundraising project to produce a child’s decorated playhouse. Raffle tickets were sold for the playhouse resulting in a $10,000 financial gain to the organization. The playhouse was displayed at the Howard County Fairgrounds and board members manned the booth to sell tickets. Mary did a fantastic job coordinating all aspects of this very successful project. 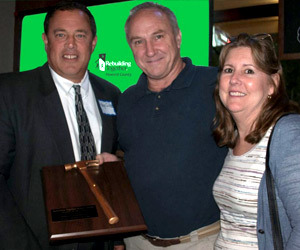 Jim Bielefeld was awarded the House Captain of the Year Golden Hammer Award. Jim’s wife Mary joined him that evening. Jim headed up the Sears Heroes At Home house working with volunteers from the Appalachian Service Project. His house project was extensive and took weeks to complete. Jim did an outstanding job leading this effort. Finally, the last award went to our good friend, Wayne Richter. Wayne is an outstanding plumber who volunteers his time and talents on Rebuilding Day. Last April, Wayne went from one project/home to another to fix plumbing problems which allowed our homeowner to live in a safe, warm and especially dry environment. We appreciate the skills and abilities of Wayne Richter.